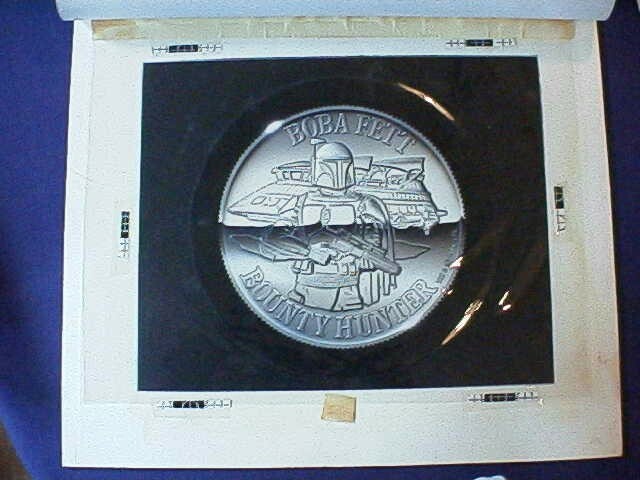 This is the original art for the Boba Fett coin that was pictured on the Power of the Force Action Figure Display. The painting appears to be a perfect image of the production Boba Fett Power of the Force coin, although the scale and image is similar to the Boba Fett coin "stage 1" hardcopy and softcopy. This art piece appears to be solely for the store display as the prints of black and white sketches for the coin series were not drawn with a metallic finish.